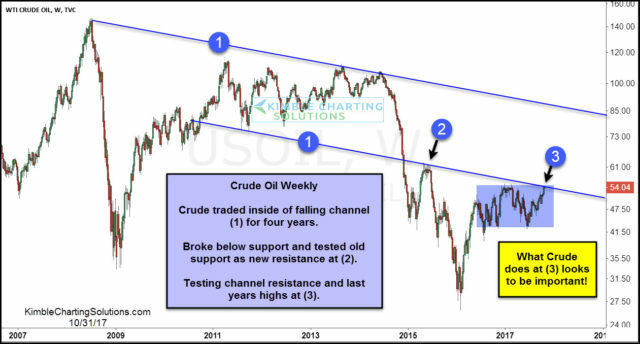 From Chris Kimble: Crude Oil has been moving higher of late, putting it at a price point that looks to be important from a long-term perspective. As mentioned above, Crude Oil is kissing the underside of long-term falling channel (1) and 2017 highs at the same time at (3). It humbly appears to the Power of the Pattern to be a very important price test for Crude. 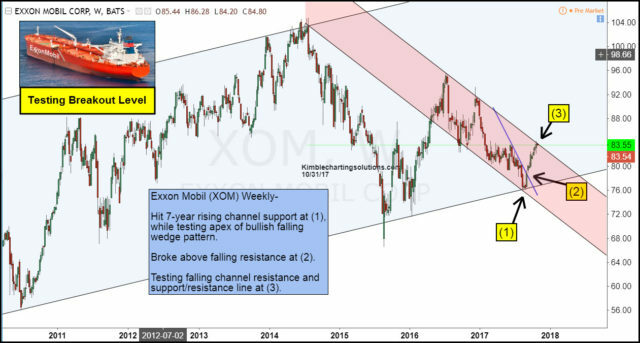 Exxon hit 7-year support recently at (1) and the rally of late has it testing the top of a falling channel and highs earlier this year at (3). What Crude and Exxon does at these key breakout tests look to be very important for the lagging Energy sector. Full Disclosure- Premium and Sector members have owned Exxon for almost two months. Stops were pulled up of late, as the breakout tests are in play. The SPDR S&P Oil & Gas Explore & Prod. ETF (XOP) was trading at $33.85 per share on Tuesday morning, up $0.1 (+0.30%). Year-to-date, XOP has declined -17.92%, versus a 16.10% rise in the benchmark S&P 500 index during the same period. XOP currently has an ETF Daily News SMART Grade of C (Neutral), and is ranked #21 of 35 ETFs in the Energy Equities ETFs category. This article is brought to you courtesy of Kimble Charting Solutions.